Many Indians were interned in a camp on the Minnesota River flats, just below Fort Snelling in 1862. Many died of malnourishment and disease. The rough photograph above is the only photograph known, according to "Historic Minnesota", of the Indian War of 1862. It was taken by refugee Adrian Ebell. 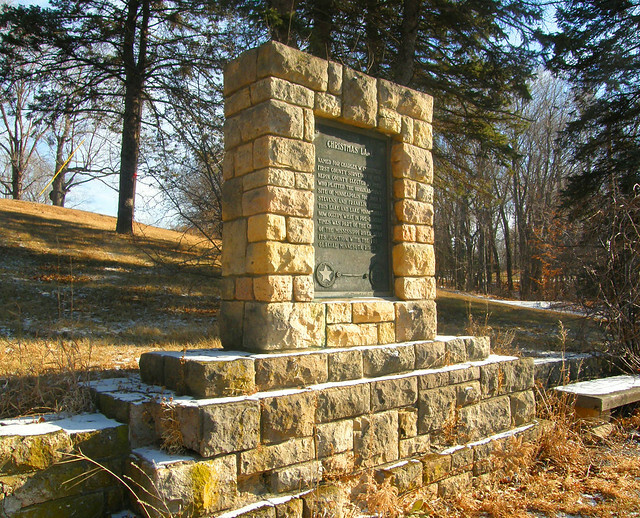 Across Minnesota pioneer settlers fled to the safety of Forts to escape random attack. 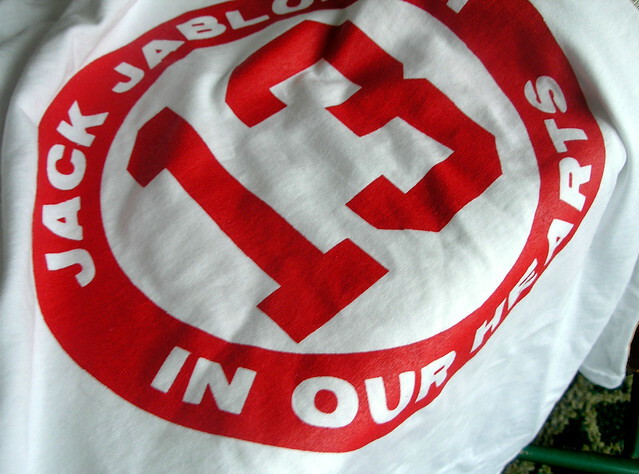 Many settlers died in their homes or standing in their fields. 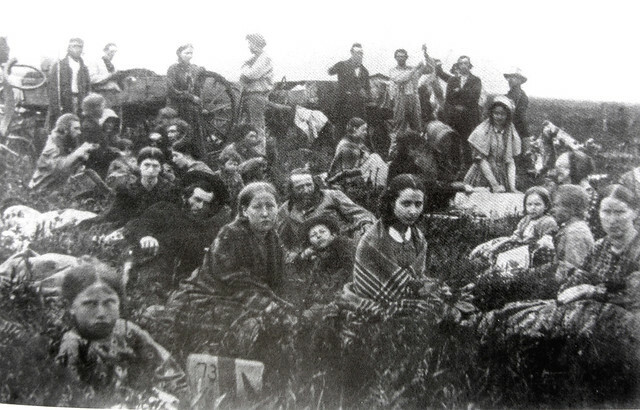 Many went back to their previous homes out East. In 1862 war broke out between the Dakota Sioux and the United States. The war lasted 6 weeks. It took place during the American Civil War, or "The War Between the States". The focus of the Federal Government was on the Civil war, and this led to delayed or broken annuity payments to the Dakota. There was terrilble famine and povery among the Dakota - and a crop blight had also struck the settlers with famine also. I have read personal accounts of the war, with graphic descriptions. It is a seldom visited era in American History, for many reasons. "Injured Benilde-St. Margaret's hockey player Jack Jablonski is ready to begin the next phase in his recovery from an incident that left him paralyzed. Jack is leaving Hennepin County Medical Center on Monday and moving to Sister Kenny Rehabilitation at Abbott Northwestern Hospital. 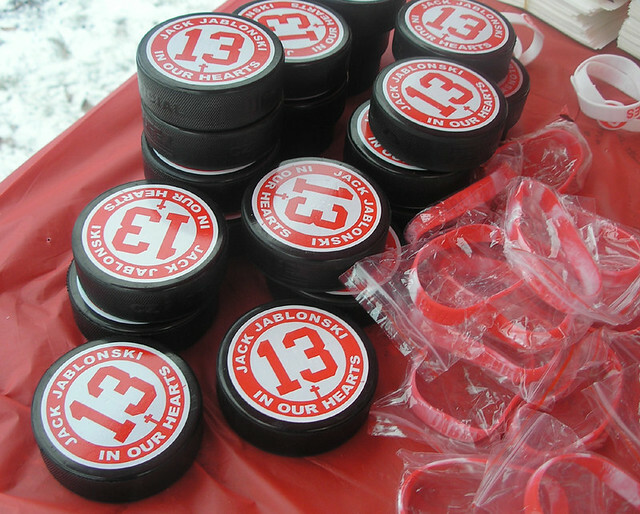 These articles were being sold at the Pond hockey tournament for Jack's benefit. 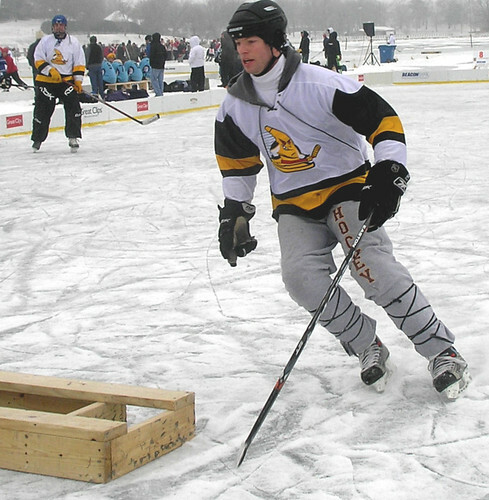 Pond hockey is growing in popularity for its emphasis on skating and stick handling and de-emphasis on checking and slapshots. Fighting is retained in both versions. 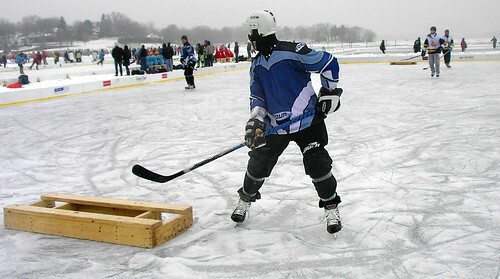 It wasn’t until Sunday Afternoon that I visited the Pond Hockey Championships at the Bayview Center. Gutless wonder that I am, I was a scared away by the sub zero temperatures of Friday and Saturday and the thin glaze of snow. But I wandered out onto the tacky ice surface at about 1pm, to wander amidst the participants and an array of mono-pod toting professional photographers. 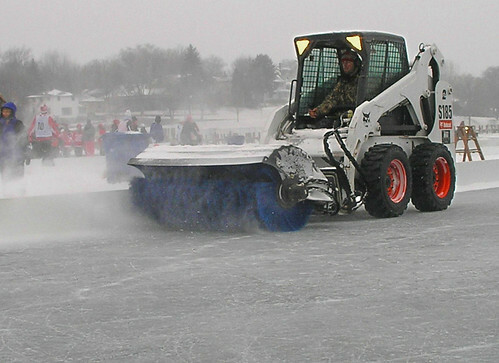 It was an active scenes with lines of skaters changing on the fly and a flurry of youths being towed across the ice by ATVs. The Red Knights of St. Johns wearing orange. 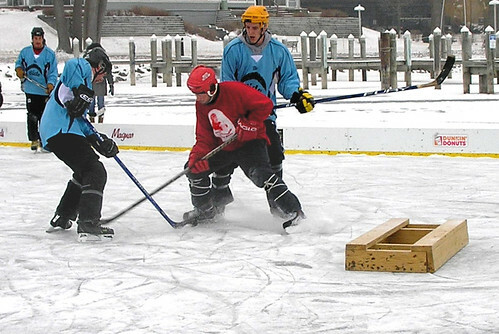 The Pond Hockey North America Championship 2012- Lake Minnetonka will be a cold one this weekend. Coldest for the spectators. I am going to wander over and hope I don't freeze my lens off. 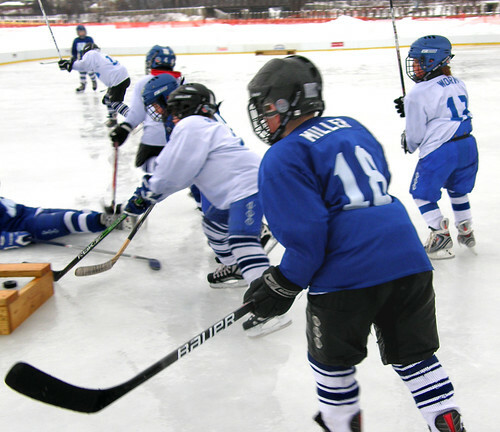 I have noticed more kids playing hockey and skating outdoors in recent years. 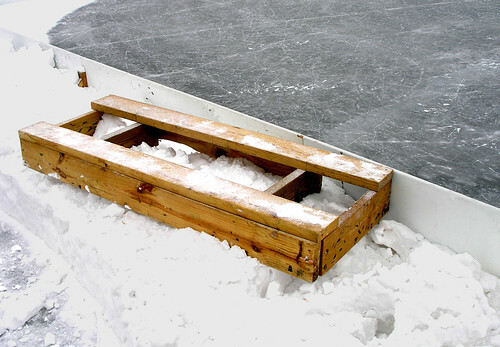 There was a time when most kid rented time in an arena and the outdoor rinks were empty. It is the economy? 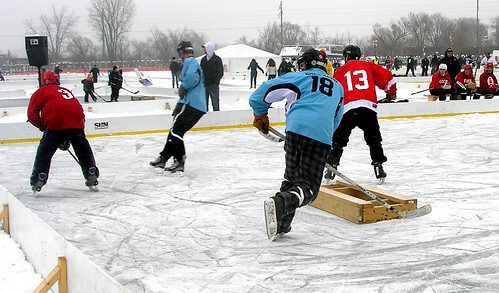 I do not know, but the pond hockey tournament pits the players against the elements as well as the opposition. You can see it openly from Highway 7. A Celtic-looking monument setting in a little pine grove. 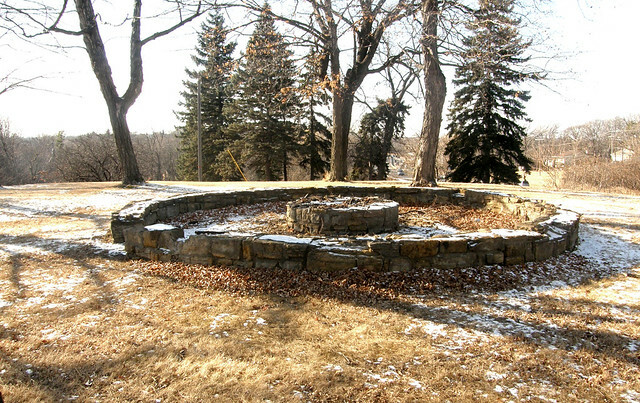 Above it is a rustic fire pit and circular stone enclosure. 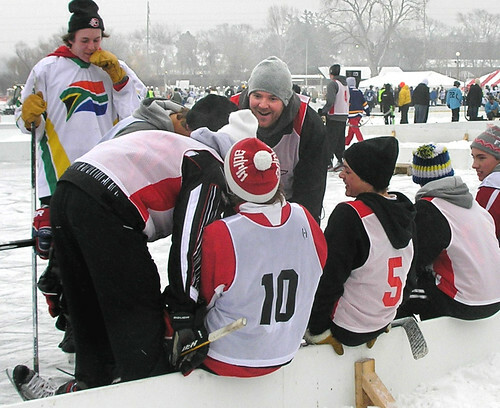 The romantic sees gatherings of Minnetonka druids pitching offerings into a fire. 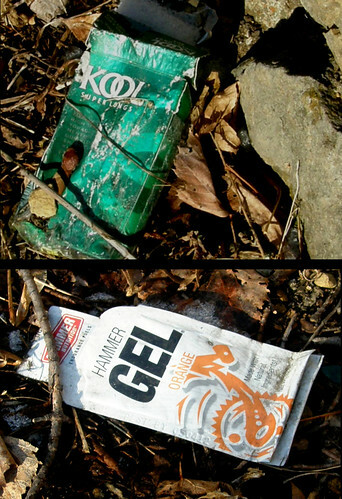 The realist sees discarded Kool cigarette packages and empty packets of energy gel. Still, it is primitive, and tucked off the dark side of Radisson Inn Road and Highway 7. The Monument for Christmas Lake - which cannot be seen from this location. "Named for Charles W. Christmas, first county surveyor of Hennepin County, Elected in 1852, who platted the original town site of Minneapolis for John H. Stevens and Franklin Steele. 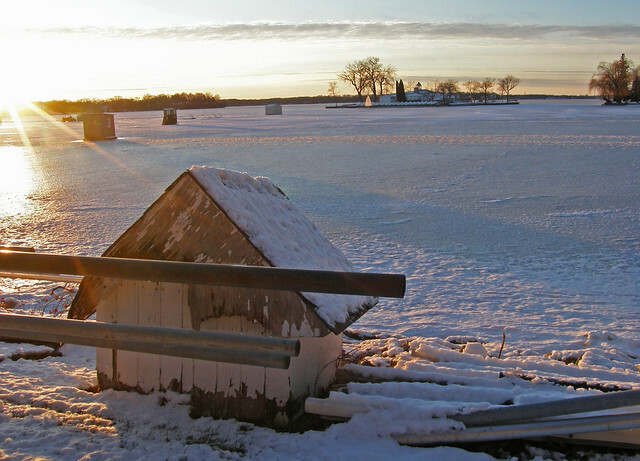 Christmas Lake and Lake Minnetonka now occupy what in pre-glacial times was part of the Misssissippi River junction with the pre-glacial Minnesota River." Howdy. 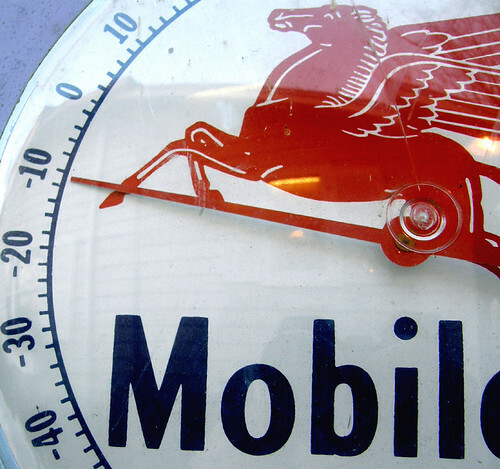 Scenes from a Hopkins antique shop. 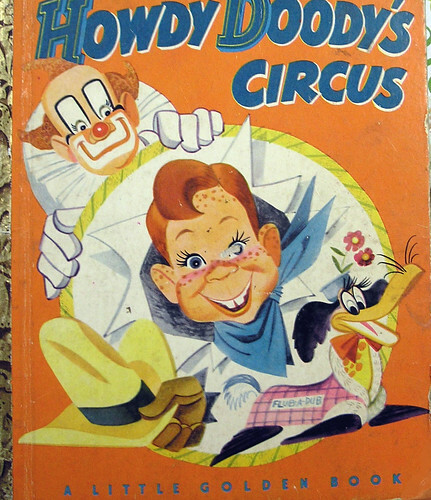 The relationship among Howdy Doody, Clairabelle the Clown, and Flub-a-dubb has always been a tenuous one. Sometimes strained, they put forth a good show for their public. Behind the scenes, as Clairabelle pulls back the psychological curtain, we find a childlike Howdy. Woodenly optimistic, Howdy has deep-rooted fears. He remembers the fate of his "Doppelgänger Howdy", who disappeared with Frank Paris in 1947, never to be seen again. Today Buffalo Bob is nowhere to be found. Often a missing, father he shows up on weekends to take center stage. Flub-a-dub displays an erratic nature that can be attributed to clinical schizophrenia. After all, he/she is a composite of 8 others. "Looking up at the White House in Excelsior. 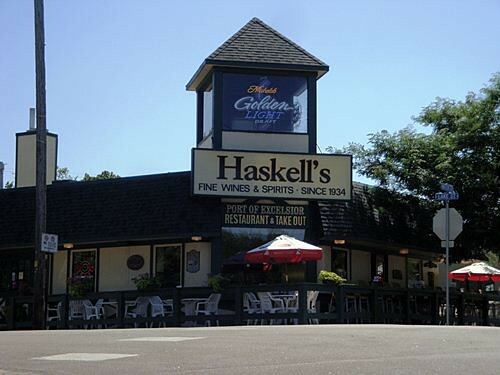 It was located on Lake and Water Street site of Haskell's now (2011). The first building on the bluff at the southeast corner of Water and Lake Streets was the Jenkins House built in 1866. In 1872 the old Jenkins House was rebuilt by son Grant Jenkins into a two-story frame house with room for 30 people. 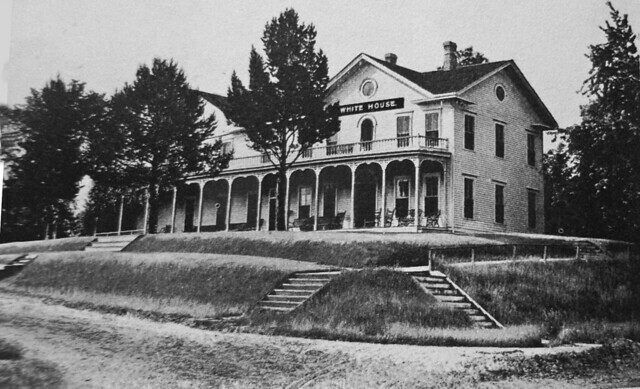 It was owned by a Mrs. Simpson and was called the Simpson House until confusion with the new Sampsion House a few years later led them to rename it the White House. In 1921 The Woman's Club of Minnetonka bought it and called it their Community House and prepared one room for a public library. In 1929 the Minnetonka Woman's donated the White House to the Minnesota Sunshine Society which converted it into a home for the aged. In 1946 the building was razed. The hill it was on was also leveled for commercial buildings." 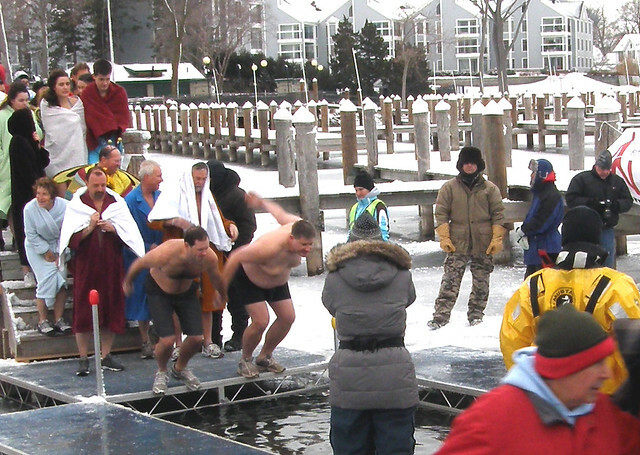 The ninth of January and only pedestrians traverse the thin ice of Lake Minnetonka. Temperatures in the 40s. 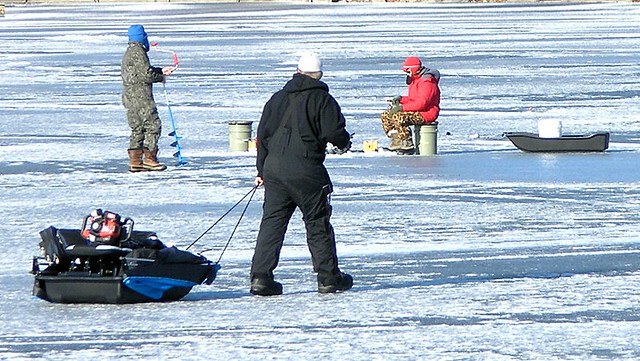 The dedicated fishermen drag their ice augers and fishing equipment out on sleds. The sun is warm. The fish are biting. 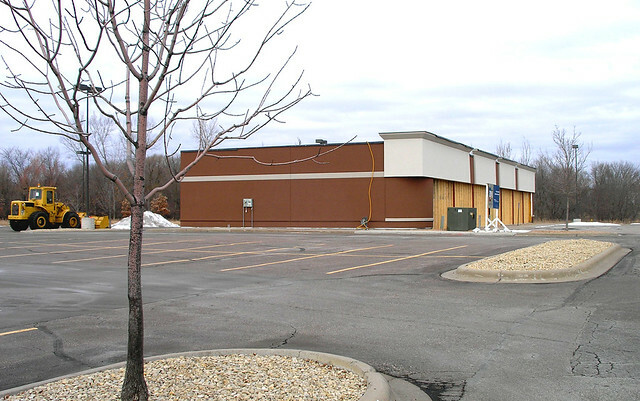 Located in the corner of the Target Superstore parking lot on highway 10, near Highway 7, is a blank building. Once it was a Blockbuster Video Store, now it sets, recently renovated and waiting for an identity. I wonder what it will be. It is a very easy-access and high visiblilty location. Blockbuster just suffered the fates of the ever changing video marketplace. Brick and mortar no more. By the appearance the space is being prepared for multiple shops. Deephaven Beach. Sunny at at sunset this Sunday. A little alliteration. I am a little giddy here in TonkaLand as the temperatures continue to soar into the 40s. 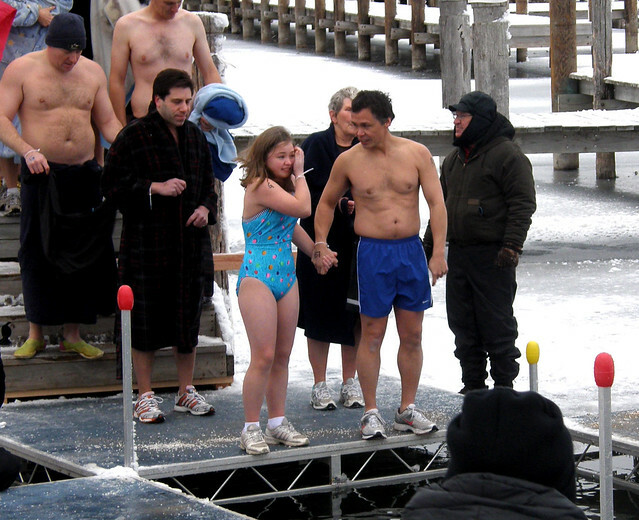 At jump time it was a balmy 27 degrees fahrenheit. 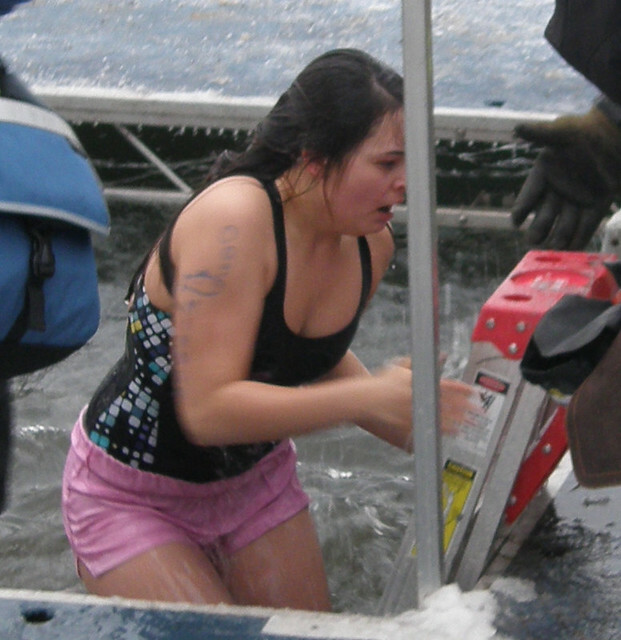 This is 40 or 45 degrees warmer than other Polar Plunges I have attended. It lacked the intensity and urgency for the participants, who in previous years shot out of the water into the warming rooms with singleness of purpose. I visited briefly, strolling in from the Lake Minnetonka Trail where a fire engine was blocking the path. No fires were encountered. Running shoes seemed were sported by most participants. No Air Jordans.